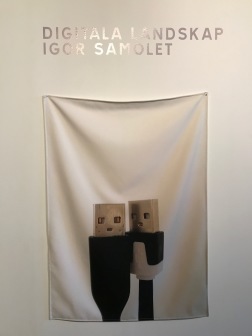 The documentary photographer Igor Samolet spent the entire month of October as artist-in-residence at Havremagasinet (Boden). 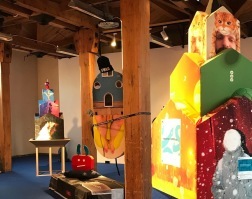 The residency, part of Swedish Lapland AiR programme, was organised by ArtNorth in collaboration with Havremagasinet, whom selected, invited and hosted the artist for the residency period. The result of his research can be seen and experienced at the exhibition Digitala Landskap / Digital Landscape (27th October 2018 - 13th January 2019). On this occasion, he planned and built a site-specific work entitled Marshmallow with Marshmallow Taste, an incredible space where nothing seems to be in its right place, except that it is. As written by the art critic Vera Trakhtenberg, "in this work he specifically expands the exhibition space by building installations that create digital windows. 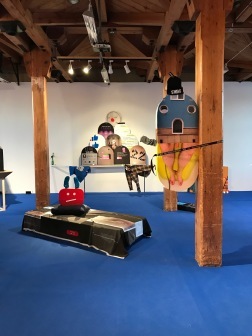 Textile objects represent the materialized evidence of our digital life – various memes, posts from Facebook, screenshots of personal correspondence and others. Igor constructs a bizarre architecture resembling Roman triumphal arches and ancient Russian churches. The arrangements become a hybrid reality landscape of the usually unseen – materializing the flow of information we lead our lives in, namely, the media arenas of the Internet"*. In other words, this big 'marshmallow room´ is a source of potential infinite solicitations. Colours, sounds, jingles, videos and movements surround us like as if we were in Wonderland, but at a closer look, we finally realise that this massive amount of images and tonalities come from a familiar world: the digital and social media. 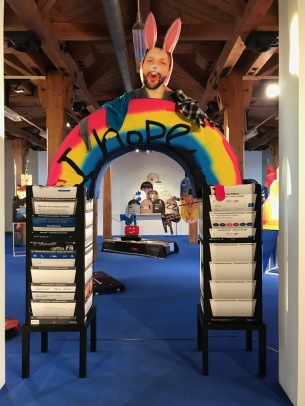 The triumphal arch at the entrance of the installation is made out of (smartphone) windows, Snapchat filters and a rainbow; frames taken from Spotify, Facebook and Whatsapp become modern graves where we can potentally be buried. Piles of coloured details and small humans running around the room are nothing but montages representing the world we are living, leading us to reflect that we really need to start thinking. A lot of questions can pop-up in our minds - and this is the effectiveness of this gigantic Marshmallow tasting like marshmallow. Where are we going? Should we continue on this technological path? Is this happiness or sadness? Do I need to medidate about my individual and collective future? What will be the next step?Will I be devoured by social media?